Most articles about Authorisation Rules are focused on request header information or Group SID – probably because these are the most common Client Access Policy scenarios. As it happens, Authorisation rules for these scenarios can be successfully created without worrying about the Claims Provider configuration. However, if you want to make an authorisation decision on some other LDAP data that isn’t in the default Claims Rules for the Active Directory Claims Provider, then a Send LDAP Attributes as Claims rule should be added to the Claims Provider rule set in order to issue that Claim before authorisation processing takes place. I don’t think this is particularly well understood based on the way that this is typically explained, but if you refer back to the TechNet links above, you will see that Authorisation rule processing acts on the output of the Claims Provider rule set, before Issuance rule processing takes place. This means that a Send LDAP Attributes as Claims rule or a transformation rule in the Issuance Transformation rule set will not be used during Issuance Authorisation rule processing. Issuance rule processing: After authorisation rules have processed and a user has a “permit” Claim, the original Acceptance Rules are processed for issuance. “Issuance” in this context means the Claims that will be returned to the user for access to the Relying Party. AD FS already knows this user is permitted (from step #2), so this step is all about the data that will be sent out. This is where I will pass through my Claims Provider Claims, issue new LDAP queries or transform incoming Claims. This set of Claims should be the minimum set of Claims necessary to make authorisation decisions in the Relying Party – by which I mean we don’t want to disclose unnecessary data to this party. Claim rules process incoming claims either directly from a claims provider (such as Active Directory or another Federation Service) or from the output of the acceptance transform rules on a claims provider trust. Having spent a bit more time with AD FS Conditional Access Policies since originally writing this, I need to clarify that there is a new MFA stage in the Claims Pipeline in AD FS 2012 R2. Those rules are “Additional Authentication Rules”, which process in between Acceptance Rule Processing and Authorisation Rule Processing. The Additional Authentication Rules stage has its own logic like the Acceptance Rule stage before it. After MFA conditions have been satisfied those new MFA Claims will be added to the set that can be used for Authorisation processing. This all makes sense because we want to make sure users are authentic and that they can meet all conditions before spending compute on further Claims processing. In order to invoke this stage of processing you can use the AD FS Management Console for simple rules evaluation, Set-AdfsAdditionalAuthenticationRule for complex Global MFA Policies or Set-AdfsRelyingPartyTrust –AdditionalAuthenticationRules for Relying-Party-specific “custom” authentication rules. This has all been explained with very helpful scenario-based examples by Ramiro Calderon and Mylo. On a totally different vector, some of the most relevant early SharePoint 2010 + AD FS content suggests that the “Send LDAP Attributes as Claims” rules should be created at the Relying Party. Or rather, there are no suggestions that it might be preferable to configure these rules at the Claims Provider Trust, and pass them through at the Relying Party. I know we relied heavily on Steve Peschka‘s and Travis Nielsen‘s content in the early days of the SharePoint 2010 lifecycle, so I don’t intend to disparage this in any way, but anyone who followed this guidance to the letter will find that Authorisation rules will not process correctly for the “Send LDAP Attributes as Claims” rules. By configuring these rules within the Issuance Transformation process, the queried LDAP attributes will only be sent out to the Relying Party. They will not be available for Authorisation rule processing. To illustrate, if I want to make an Authorisation rule based on Group SID values, it will work, since this is passed through from the default Claims Rules for the Active Directory Claims Provider, but if I want to make an Authorisation decision on E-mail Address, department or extensionAttribute13, it won’t work unless I add Send LDAP Attributes as Claims rules for these attributes to the Claims Provider rule set. This is not to say that it will always be the right decision to create all of my Send LDAP Attributes as Claims rules on the Claims Provider Trust. If I have five Relying Parties with different outbound Claim Types, I would be adding a lot of unnecessary LDAP query weight at sign-on. But if I have a common set of Claim Types across my Relying Parties (as is probable in the SharePoint world), then it will probably make sense to move my Send LDAP Attributes as Claims rules over to the Claims Provider rule set, which has the added benefit of making these claims available for authorisation decisions. Before porting these rules to the Claims Provider rule set, I would update the Relying Parties to pass through these Claims, then delete the original Send LDAP Attributes as Claims rules after everything has been ported. 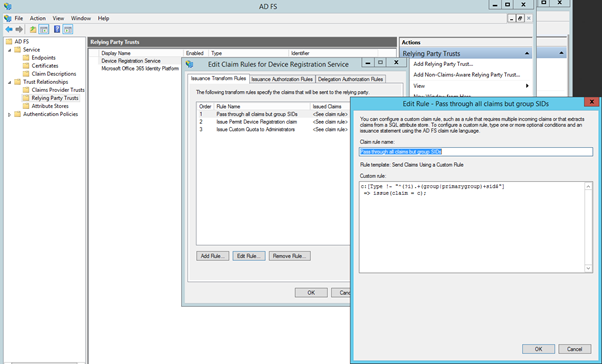 One point of reference that’s informative to me is the Device Registration Service Claims rules in AD FS 2012 R2. This is the one Relying Party that ships with AD FS, and it is configured to pass through Claims from the Claims Provider, rather than issuing a separate query. Based on this reference, I think that passing through should be the default approach, unless there are benefits to separating out. To add a bit more mud to the water, if we fast-forward the AD FS 2012 R2 TechNet article on Manage Risk with Conditional Access Control (which includes Authorisation Rules), there is a long list of, “the claim types available in AD FS in Windows Server® 2012 R2 to be used for implementing conditional access control”. What I find confusing is that we can always add Claim Descriptions beyond those listed here. These are just the default Claim Descriptions that ship with AD FS. We aren’t limited to making authorisation rules on this set. To make things a bit more confusing, if we look at page 34 of this Tech-Ed presentation, “Claims available for conditional access control”, the list is even smaller. In short, this is a red herring, but a confusing one if you’re trying to figure out why authorisation rules aren’t working. Perhaps this list is intended to describe the Claims available for “Additional Authentication Rule” processing, as described by Ramiro Calderon in his post, but it certainly isn’t clear if that’s the case. I will try to answer this question in due course. To sum all of this up, other than the TechNet articles at the top of this post, nearly all of the good blogs on the syntactical difficulties of the AD FS Claims Rules Language focus on the construction of Authorisation Rules and Issuance Transformation with Add and Issue statements. I’m not finding any definitive documentation that goes in to detail about the Active Directory Claims Provider. I think we can assume rule #9 comes from a certificate when certificate authentication is used, but this leaves an open question about where this Claims Provider “passes through” the other nine of its ten default attributes from. I think this is a strong clue. It would be good to know more concretely whether any other Claims can be passed through here, or if all other Active Directory Claims need to be constructed as Send LDAP Attributes as Claims rules. For now I am assuming that they must be, as the attributes I’ve tested only worked as Send LDAP Attributes as Claims rules. If anyone else has more definitive information about this I would welcome it. At any rate, I hope this helps clear up how to construct Authorisation rules, as I’ve incurred some cranial bruising along this path. I’ve added a fairly major update here that may be of help Andrew. Your article is good to have backgrounds of the Multi-factor Authenticaton. The figure “MFA Claims Flow” give a overview of the flow. I tried to model the figure in Archimate and if you want i can send you a png-image. Hi Gert. Sorry about the slow reply. That diagram is actually from Ramiro Calderon, I was just referencing it here. Here is a link to his original post. It might be more appropriate for Ramiro to have the diagram since he authored it.